Researchers from the National Park Services' Submerged Resources Center in Denver launch from St. Croix National Historic Site at Calais Thursday. The five-person team is exploring the intertidal waters around St. Croix Island and Red Beach seeking historic artifacts from the French settlement of the island in 1604. "We haven't found too much," archaeologist Bert Ho said. The team, which has been on site for a week, will also be assessing the eastern side of the island, which is eroding near an ancient burial site. 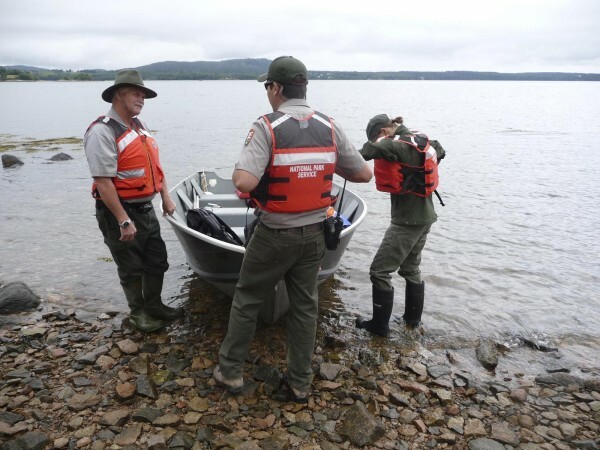 CALAIS, Maine — A team of five researchers from the Submerged Resources Center of the National Park Service, located in Denver, has been exploring the intertidal waters around Saint Croix Island and Red Beach. The historic site, long known to locals as Dochet Island, is a small, 6½-acre uninhabited island near the mouth of the St. Croix River that forms part of theinternational boundary between Maine and New Brunswick. The island has special significance to both Canada and the U.S. as the first French settlement in the area, dating back to 1604, according to Park Ranger Meg Scheid. During the first winter, more than half the settlers perished due to a what is believed to be scurvy. Those who survived went on to settle in what in now Quebec. Archaeologist Bert Ho of the National Park Service said Thursday that the team has not found anything of significance during their first week of exploration. “We have found a lot of historic debris,” he said, which is a polite way of saying they found a lot of trash. The team is using metal detectors, side-scan sonar and personal viewing by underwater diving to map and assess the area. Although the historic island has been the site of many important archaeological digs in the past, Ho said this is the first time the intertidal waters have been researched. He said the search of the area is being conducted in a very systematic and detailed way and that precise maps will be created of the area. “It’s a bit different working here than in other National Park tidal zones because there is such a large tidal range here,” he said. Ho said the research team will also be creating a baseline study of the east side of the island. Ho said the erosion is getting uncomfortably close to the burial ground. St. Croix Island was known as Bone Island in the 18th century after many of the graves were exposed by erosion, according to a history of the park. Twenty-three sets of remains were removed in 1969 and subsequently reburied in 2003. Sheid said that although visitors are not allowed on the island, they often sneak onto it. Rangers and others are concerned that artifacts are being lost. Sheid said there are signs at the St. Croix National Monument in Calais warning visitors not to take anything from the park. She said she often finds stones, rocks and other items at the base of the sign where people have dropped them. Sheid said the research team is prepared to stay until Aug. 24.